To check the status of your application for admission to the Clark Honors College, log on to DuckWeb and select the "Admissions Menu". Choose "Check Honors College Undergraduate Application Status." NOTE: High School Transcript and SAT or ACT Scores are shared between the UO and the Clark Honors College. 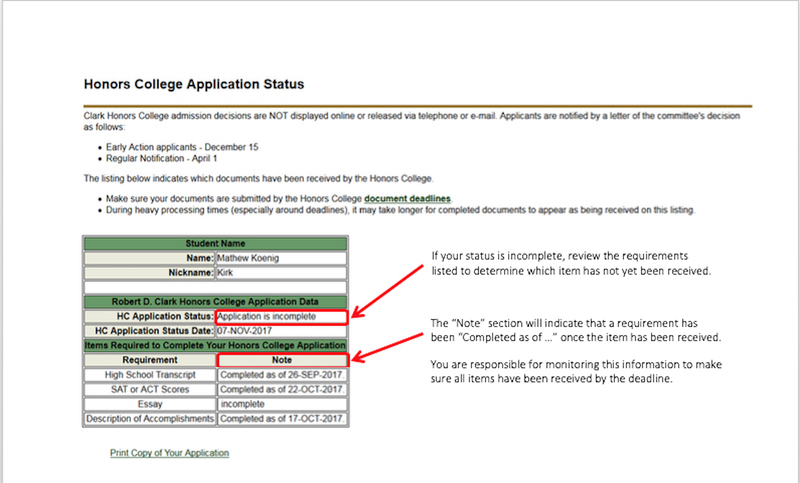 If the UO "Application Summary" shows this item as complete, but the honors college application does not, there is no need to resend the document; the information will be processed shortly. To also check the status of your application to the University of Oregon while in DuckWeb, navigate back to the "Admissions Menu" and click on "Check Undergraduate Application Status."